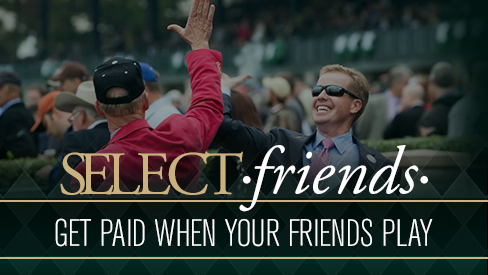 If you have friends that enjoy betting on racing as much as you do, then refer them to Keeneland Select. The Select Friends program allows you and your friends to earn money straight into your account. Complete the Select Friend’s Form. An email is sent to your friend(s) with a referral code. Your friend must use that code in the promotional code area when signing up. Friend must open a Keeneland Select account. Friend must deposits a minimum of $50 into their account within 30 days of signing up. Friend must wager a minimum of $500 in the first 60 days. *To be eligible to receive referral bonus(es) you must be an active account member of Keeneland Select. To be eligible to sign-up for Keeneland Select, your friends must be a legal U.S. resident age 21 or older residing in a state that allows online wagering where Keeneland Select is available. Referral bonuses will only be paid for those friends which are new Keeneland Select account holders and live in households which do not already have, (or previously had) a Keeneland Select account. New registrations through Select Friends can only receive one new registration promotion. If a new registration receives the $100 promotion through Bet $100 Get $100, they will not be eligible for the $50 promotion with Select Friends.